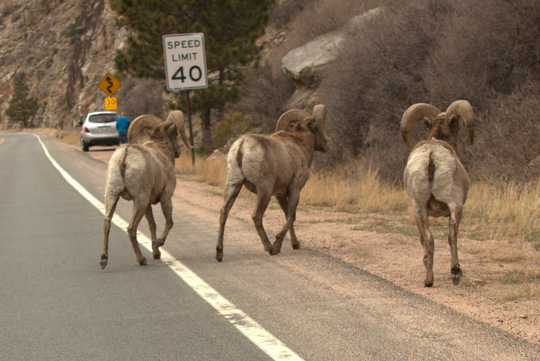 Recently, while cruising through the Big Thompson River canyon, we spotted a bunch of Bighorn Sheep. That in itself was not particularly unusual or shocking, but the cool part of the trip was seeing a group of 3 mature rams hanging out on and around the highway. These bad boys were sporting some serious head gear, and I would hate to be on the receiving end of a headbutt from one of these critters. I always liked when the males did the head butting thing. A serious Tylenol moment. Mark, that always intrigued me as well. I've often wondered what sort of effect, both short- and long-term that would have on the brain. I didn't know you could catch "crazy" through the interwebs. I hope I'm not responsible. David, they are fairly common sight, your right there. But, I am in awe of the picture opportunity you had and how it turned out. Big time good!